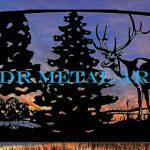 Gate Hinges - Custom Driveway Gates - Iron Steel & Aluminum - JDR Metal Art - FREE Standard Shipping! Hinges are by far the most critical component of a functional driveway gate. 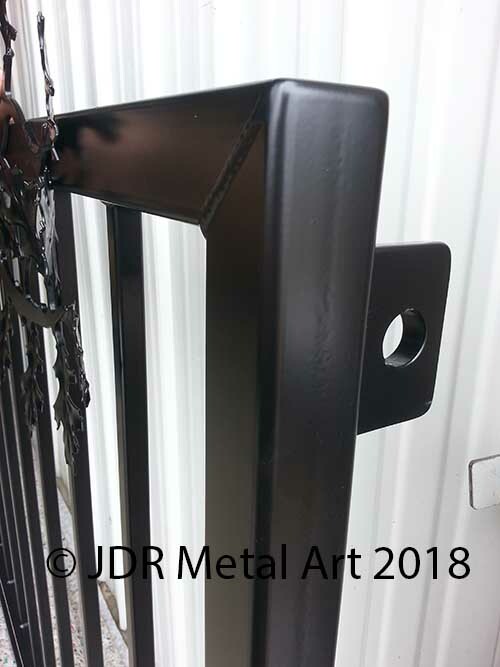 Here is an example of a weld-on type of driveway gate hinge I make for customers who already have their existing gate posts installed onsite. 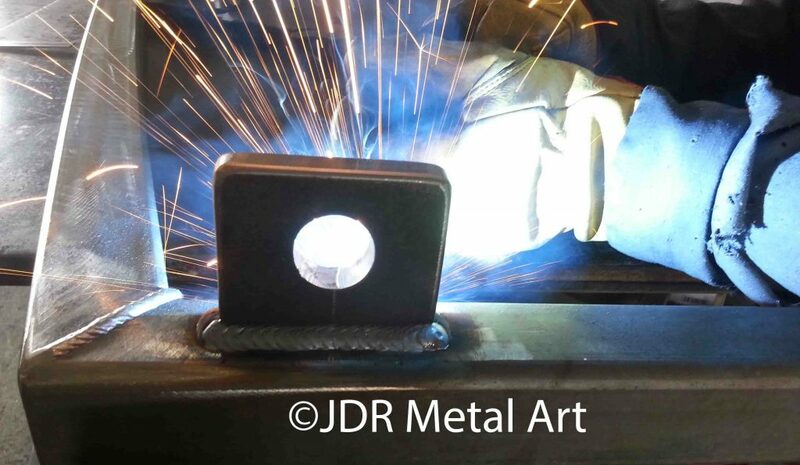 The brackets are degreased and ready to weld, clean up with a wire brush or wire wheel and then paint with primer and the matching Rustoleum paint. Weld-on hinges can be made to weld to either steel or aluminum posts depending on which metal your existing posts are made from. This is our most typical scenario, the posts are supplied with the gates. These steel gate posts already have the brackets welded to the posts. 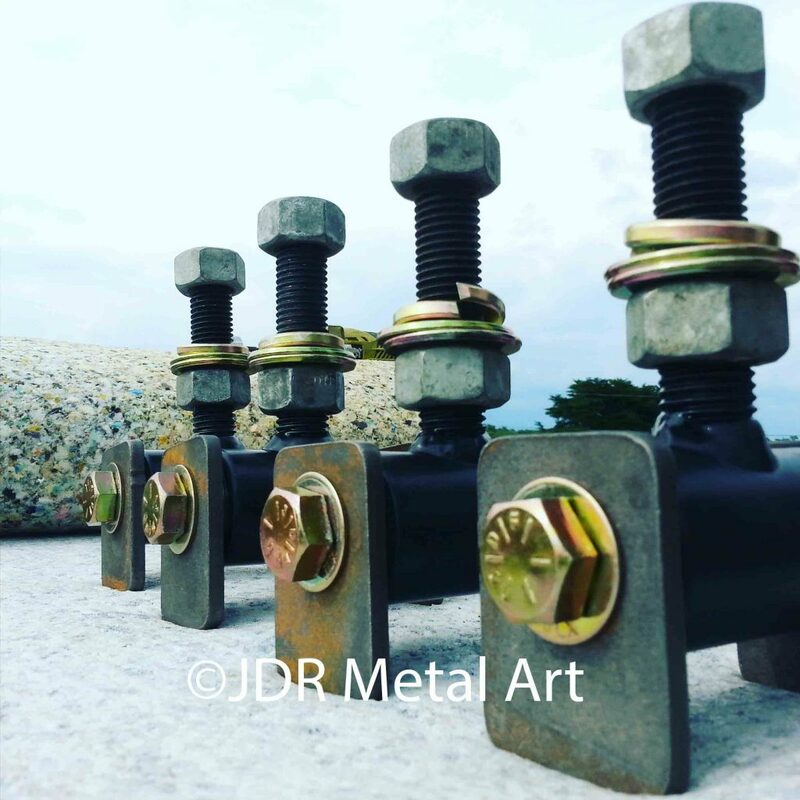 Everything simply bolts together on site with four supplied 5/8″ bolts Grade 8 bolts and hardware. Here are some of the steel 4x4x1/4″ gate posts built to accommodate the custom hinges. 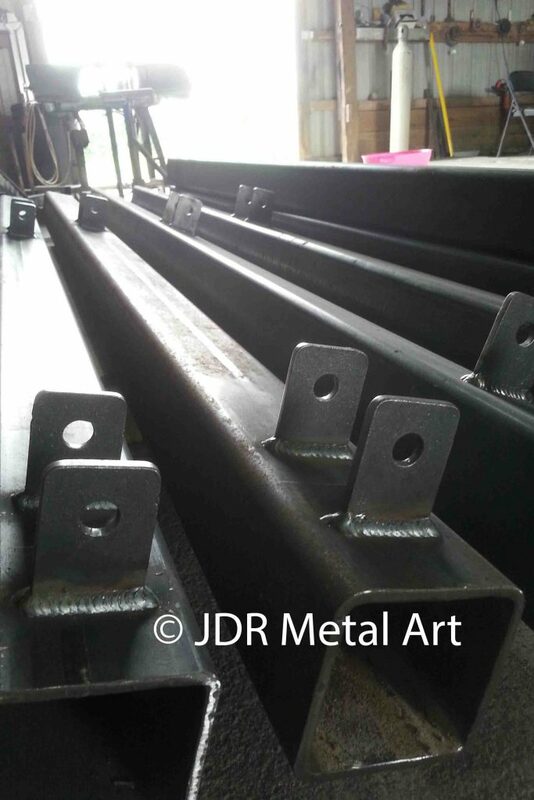 Below are 1/2″ thick brackets which receive the threaded rods. 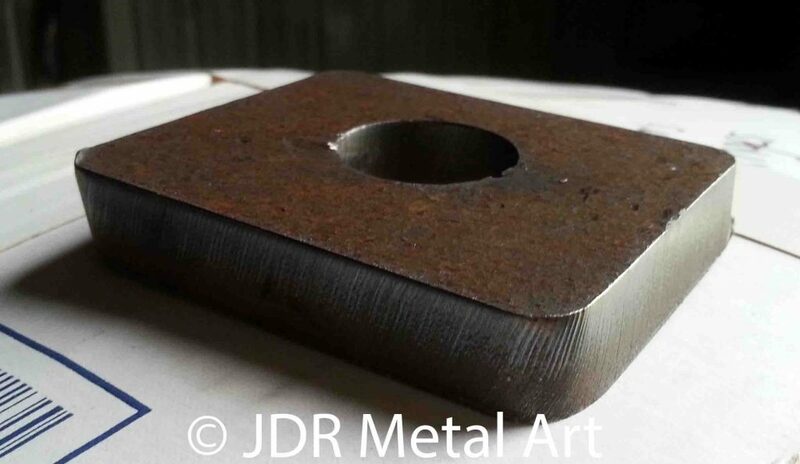 These plates are made to bolt to wood posts or masonry columns. There are several key questions to think about when selecting heavy duty driveway gate hinges. Are the hinges adjustable? If they are adjustable is it a mere half inch of adjustment or several inches of adjustment? Do they require regular maintenance such as greasing to keep operable? Are they a long term solution? Are they durable enough to last decades without binding up, bending or snapping off? 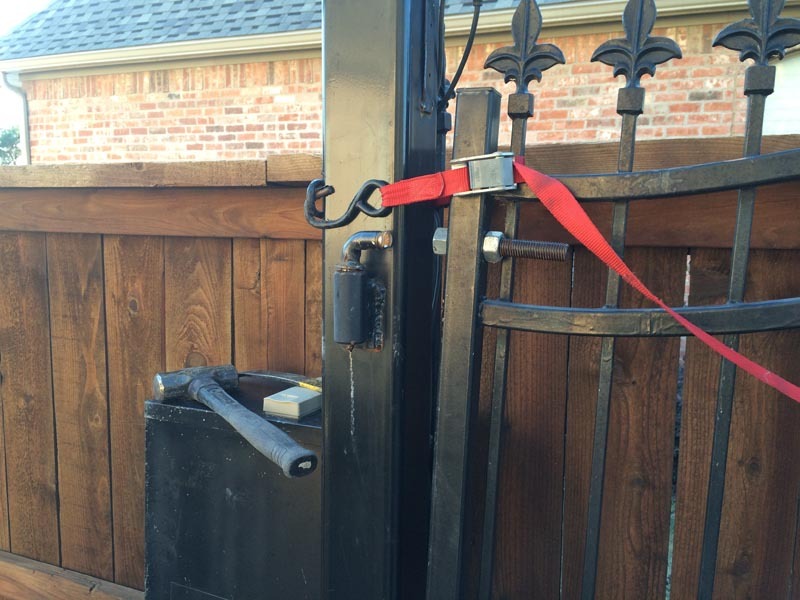 In my experience of dealing with gate installers from all across the country, most if not all prefer to have several inches of hinge adjustment to work with. Sometimes the gate posts aren’t set 100 percent perfectly and without at least an inch or two of adjustment it can be a nightmare to have gates properly line up. Many of the very expensive hinges being I’ve bought and used in the past have a mere 1/2″ of adjustment to work with. A gate post can read within the lines on a level and still be a half inch or more off from top to bottom if the post is sticking 5′ out of the ground. Maintaining the gate hinges on a semi-annual basis is a must for many types of gate hinges. The J bolt hinges must be lined up very perfectly at the time of installation to avoid uneven wear within the hinge. The uneven wear can be held off for a while if the hinges are greased regularly. Achieving this perfect alignment for long lasting use can be nearly impossible considering that these premade hinges are built using outsourced labor with very sloppy tolerances. Often times the hinges arrive with the hinge socket being several degrees out of square, thereby guaranteeing a near-term failure straight out of the box. J bolt hinges are also a problem because they bolt part usually protrudes through holes drilled in the hinge rail of the gate. These holes are a place where water gains entry and accumulates inside the gate and causes it to rust from the inside out. The driveway gate should open and close with just the push of a finger or by the slightest breeze. 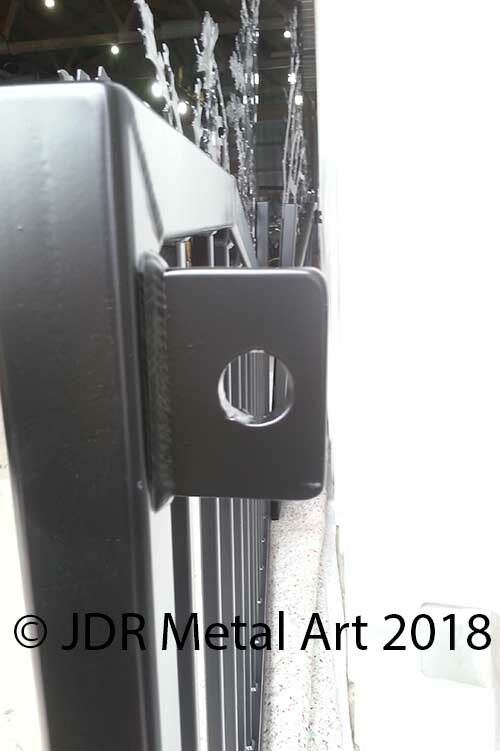 The first indication of improper installation or neglect will be a screeching sound coming from the hinge or difficulty opening and closing the gate. By this time there is usually already a well-worn groove that will develop further until eventual failure of the hinge. Adding more grease at this point is just delaying the inevitable and creating a safety issue. The hinges I build do not have to be greased regularly. 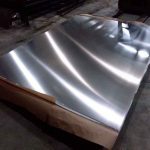 They utilize a sealed roller bearing that keeps moisture and dirt out while keeping the grease inside. Premade driveway gate hinges are not cheap. 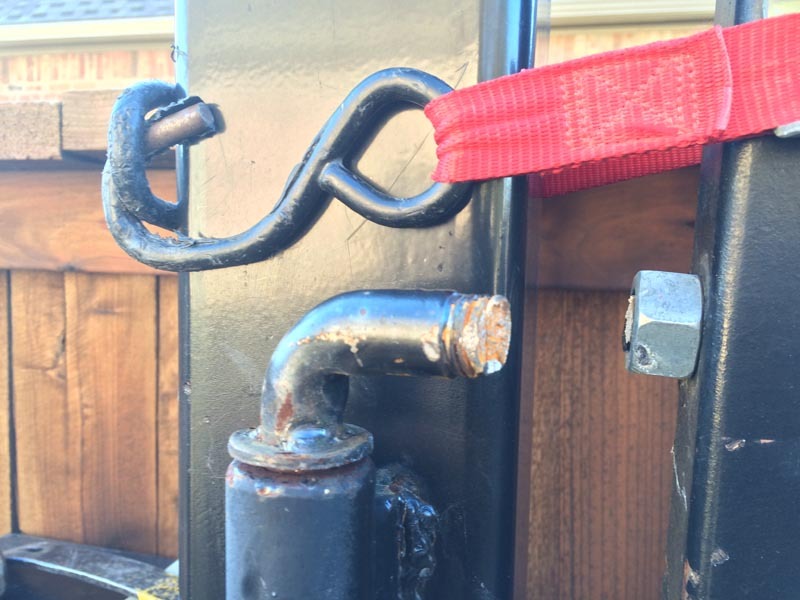 The cheapest hinges that should be used for a driveway gate are the 3/4″ J-bolt, which run around $50 a pair. The next most affordable type of hinge I’ve found is around $60 a pair for a roller bearing style hinge. Other manufacturers are charging $100 or more for per pair for these same hinges. As far as I know, they are all using outsourced labor to build them. These costs all add up quickly, especially considering there is probably only a couple of dollars worth of material in each set of hinges and probably a dollar or less in foreign labor. A quality gate requires a quality hinge.